Can you imagine suffering through a hot, humid Kentucky summer without a working air conditioner? At Arronco Comfort Air, we work hard to ensure that all of our customers have a good working air conditioner for the summer months. Yet have you ever stopped to consider just how that air conditioner keeps you cool? 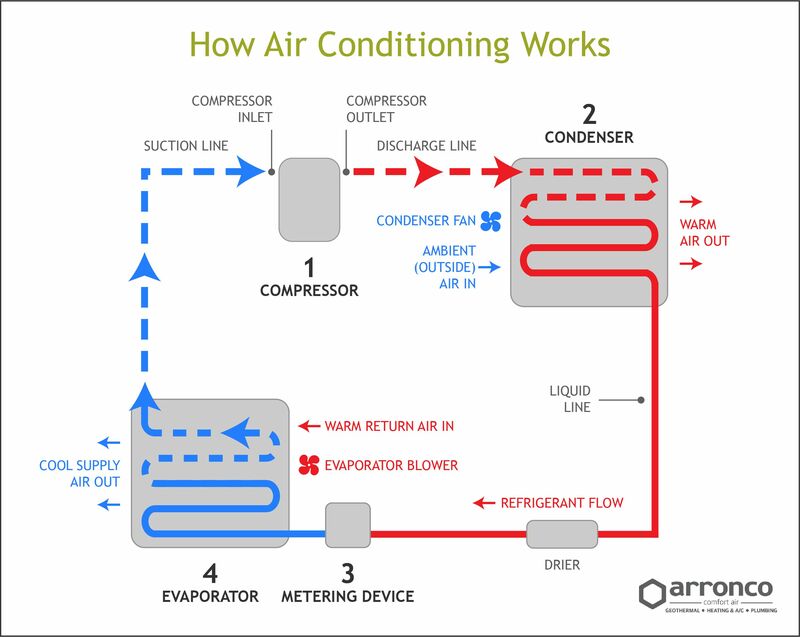 Here’s a closer look at how air conditioners work. The main concept behind the way an air conditioner works is the transfer of heat. The air conditioner gathers heat from one area of the system and moves it to another. Removing the heat creates cold, and that cold is pumped through your home to keep you comfortable. To make this process happen, the system has several important components that all must work together to cool the air inside your home. The compressor in an air conditioning system is sometimes called the “heart” of the system. Your air conditioner pumps refrigerant through the compressor to ensure it can fully cool your home. Refrigerant enters the compressor as a gas. Once inside, the gas is compressed, increasing its pressure and temperature. The gas leaving the compressor is extremely hot and under a high pressure. The compressed, hot gas moves into the condenser coil. A fan blows air over the coil to cool the refrigerant, allowing it to condense into a liquid and change its state. This all happens in the system’s outdoor unit. Once the refrigerant is in its liquid state, it is ready to go back inside the home. After leaving the condenser, the liquid refrigerant passes through a metering device that controls its flow to the evaporator. The metering device represents the point at which the refrigerant drops from high to low pressure. The evaporator coil uses hot air from the home to heat the refrigerant until it boils and changes back into a vapor. The refrigerant absorbs the heat, leaving the air around the evaporator coil cold. Once the vapor is sufficiently heated, it returns to the compressor to start the cycle over. The evaporator is located inside your home in the air handler. This handler blows hot air over the evaporator coil and then blows the cooled air through your home’s air ducts. If the home has a furnace to create a complete HVAC system, the air handler will be part of the furnace, and the evaporator will sit on top of it. One (or more) thermostats control the cooling system, adjusting the system settings and turning it on and off as the temperature in the room changes. As you can see, there are many moving components that have to work together in unison to properly cool your home. If you are having trouble with your air conditioner, any one of these system components could be to blame. That’s why you need the help of a professional to diagnose and repair the problem. If your air conditioner is not working as it should, give us a call or contact us online to talk to one of our air conditioning experts about your concerns!